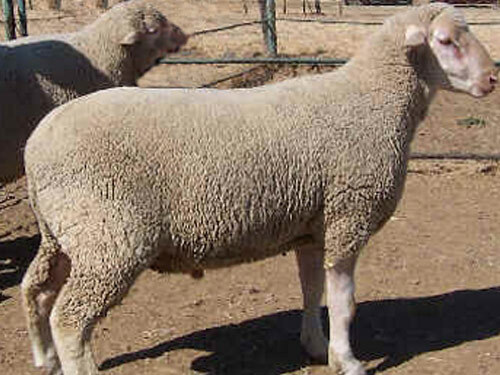 SAMMs were imported into South Africa by the Department of Agriculture from 1936 to 1974 from Germany where the Deutsche Fliesch Merino is a common meat sheep of Germany, Austria, and Poland. In South Africa, the name was translated as Duits Vleis Merinoand then into English as German Mutton Merino. In 1974, the South African Breed Society changed the name to the South African Mutton Merino. When imported into Australia in 1996, Western Australian SAMM breeders registered the name Prime SAMM, as the Australian usage of the word "'Mutton" relates to a description of extremely old and inedible sheepmeat. The translation used in Australia is "South African Meat Merino." The SAMM is bred specifically to produce a slaughter lamb at an early age (35 kg/77 lbs. at 100 days of age), while still being able to produce good volumes (4 kg/8.8 lbs) of medium to strong wool.